Whether you are whipping up some egg whites or need to knead dough for homemade pizza, there is no debating that a hand mixer is one of a cook's best helpers! 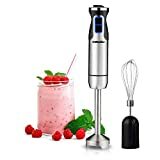 The best mixers should make your life easier in the kitchen, but choosing the right one, when there are just so many options out there, can see harder than making the perfect souffle! Not any more; we have put together this hand mixer buying guide to help you choose the best hand blender for your needs. Traditional Hand Mixers: Traditional hand mixers have two turning blades and offer the most mixing variety. From kneading dough to crushing ice, these mixers can handle tough mixing jobs like pros. With a variety of interchangeable accessories available, traditional hand mixers are a great choice for frequent mixing and busy kitchens. Immersion or Wand Mixers/Blenders: Smaller and more compact, immersion mixers puree and blend soups and sauces like an expert. As these mixers are narrower and have one blade, they can be immersed into a variety of shaped and sized containers. They are great for those small jobs and small kitchens that lack a lot of storage space. Size: Hand mixer buyers who choose a type and size of mixer suited to their mixing needs are a lot more satisfied with their purchases. Infrequent mixers love the small, compact wands, while cooking enthusiasts who mix a variety of things rate their traditional mixers higher. Choosing a hand mixer to suit your needs will ensure more buyer satisfaction. Speeds: Hand mixers with slow start features are by far the best reviewed of the hand mixers. It is particularly important to consumers that the slow-start feature is very slow and that the mixer has varied speeds to make mixing a variety of things possible, as well as making cleanup easier. 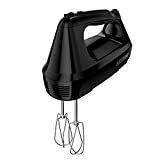 Attachments: Hand mixer owners, especially those with traditional hand mixers, rate their models best when they come with attachments that make whipping up different kinds of recipes simple. Included attachments are also seen to increase the value of their purchase and thus make their mixers better value for money and a better investment. Controls: When it comes to easy to operate hand mixers, units with digital displays and buttons are rated much higher than those with knobs. 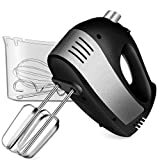 Users note that this is because knobs are easily knocked during operation and those impromptu speed adjustments can cause havoc to the recipe and create messes that have to be cleaned. The first two things to ask yourself when choosing between the two types of mixers are: How much storage space do I have, and how often will I be using my mixer? For smaller kitchens and less frequent use, immersion hand mixers might be best suited, while traditional mixers are much better suited for more use and busier and bigger kitchens. A good hand mixer should come with variable speed settings to make sure you have the slow speeds needed for dry ingredient mixing and faster speeds needed to get frothy egg whites. When choosing a mixer, it is useful to consider the weights of your model choices, since the heavier the mixer is, the shorter the time it may be comfortable to hold. The most popular weight choice for maximum comfort is around 3 pounds. Hand mixers with swivel cords will offer better maneuvering, especially for left-handed users. The power of a hand mixer is determined by the wattage, RPM (revolutions per minute), and the shape of the mixer. The higher the wattage and the more RPM the unit has, the more powerful the mixer will be. 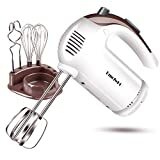 For the best power, choose a hand mixer that offers powers of 175 watts and higher. Newer, thinner designs with curved wire made from stainless steel offer a lot more power when mixing. What ingredients will you be mixing? Hand mixer blades are either made from stainless steel or plastic. Stainless steel blades are durable, and plastic blades can mix the toughest ingredients. 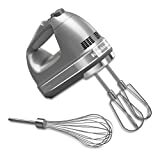 For the most variability, look for a hand mixer that includes wire whip (for cream), flat beater (for batter), and dough hook (for kneading dough) attachments. Hand mixers come with a host of features. Here are a few worth investing in: a soft or slow start feature, to reduce splattering and therefore make kitchen cleanup much easier; slanting handles that provide a much more comfortable holding posture; and touch pad controls and detachable blades that make the unit easier to clean. 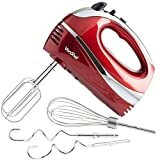 KitchenAid: Kitchenaid opened with their iconic stand mixer in 1919, and since then they have expanded their range to include a host of high performing quality kitchen products, including hand mixers. 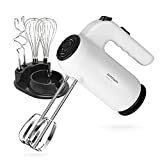 Hamilton Beach: One of the leading kitchen appliance brands, Hamilton Beach have designed their hand mixers for versatility and comfortable handling. 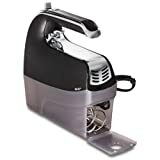 Proctor Silex: Since forming in 1920, Proctor Silex have become an expert in kitchen appliances and are known for their quality top rated products including hand mixers. 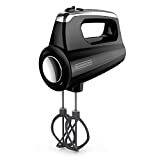 Oster: The Oster brand began in 1924, and they now manufacture a host of appliances in the beauty and cooking sector and offer good quality hand mixers for affordable prices.